You can create custom reports in your ActiveCampaign account. These reports can help you analyze information and answer specific questions you and your team may have around data or certain activities. When you create a custom report, you can save it to your account so you can access it at any time. 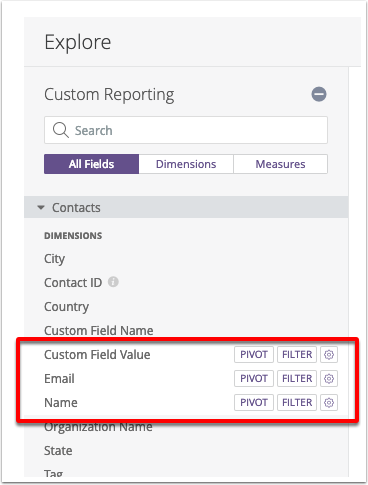 In this article, we'll show you how to create a custom report that lists all contacts with a specific custom field. 1. Click the "Contacts" view located under Explore. This will expand the "Contacts" view. 2. Next, you'll need to add the Email dimension to the report. 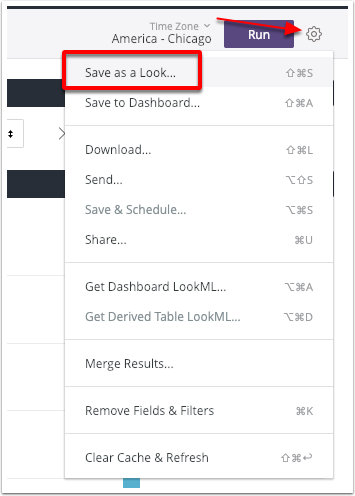 Click "Email" located under "Add Fields." 3. 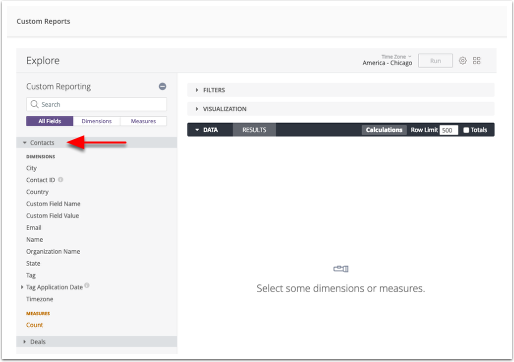 Add the Name dimension to the report by clicking "Name" located under "Add Fields." 4. Add the Custom Field Value to the report by clicking "Custom Field Value" located under "Add Fields." 5. Now you'll need to add a "Custom Field Name" filter to the report. 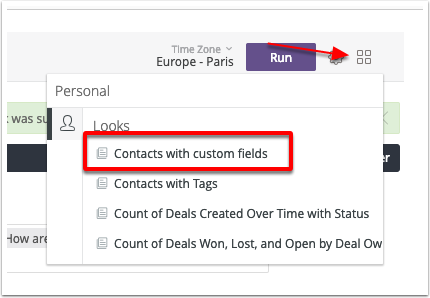 This will allow you to only report on a single custom contact field. 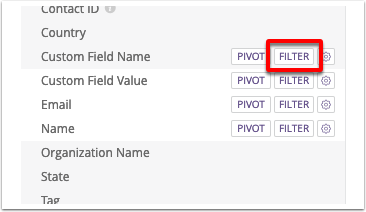 To add this filter, hover your mouse over "Custom Field Name" and click the "Filter" button. 6. Go to the Custom Name Field filter. This is located under the "Filters (1)" header located on the top of the report. 7. 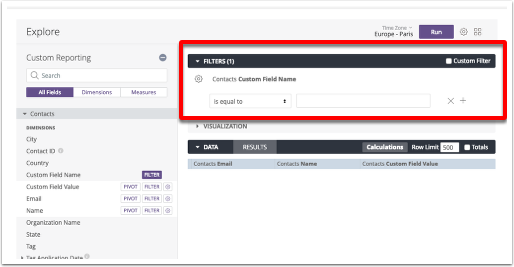 Type the name of the custom contact field you want to display data for into the field provided. Note that as you type, the field will suggest field names for you. 8. Click the "Run" button located above the Filters header. You will see a list of all contacts who have the custom field value. Once you create your custom report, you can save it in your account so you can pull it up later. To do so, you'll need to save this report as a "Look." 3. In the "Title" field, type a descriptive title. For example, you can name this report "Contacts with Tags."